English in Common is a six-level American English integrated-skills course for adult and young adult learners based on CEFR standards and learner outcomes. English in Common 4A Split Student Book motivates learners through Can Do objectives which give direction and purpose, ensuring students know what they are learning, why they are learning it, and how they will be able to use the language outside of the classroom. English in Common 4A Split Student Book engages learners' interest by offering a new twist to familiar topics -topics that reflect students' needs and interests. This ensures that students will always have something to say about the content of the lesson. English in Common 4A Split Student Book encourages active participation in learning by guiding students to use their own knowledge as they observe structures in context to figure out language use and form independently. 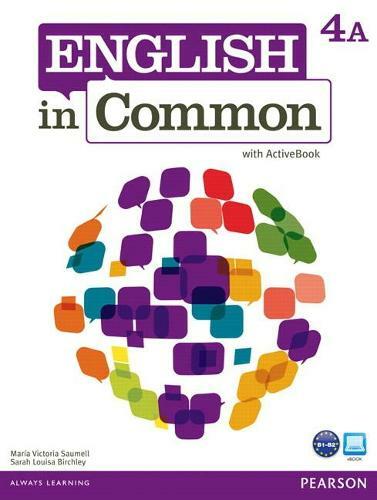 English in Common 4 Student Books are divided into either ten or twelve units and have enough material for approximately 60 to 90 hours of instruction. Each Student Book has a bound-in ActiveBook, which contains a digital Student Book with the entire audio program, Extra Listening practice and activities, and a printable Language Portfolio to help students keep a record of their progress. This is a Split Edition, with combination Student Book and Workbook covering the first half of the level. This version is also available as a blended learning program with MyEnglishLab - an online learning tool for personalized practice, with automatic gradebook. Level 4 is for Intermediate students, and covers competencies in the B1-B2 bands of the CEF.